Sapa is an attractive town located in Vietnam’s remote Northwest Mountains. Sapa is famous for both its rugged scenery and its rich cultural diversity. Sapa is also known as an incredibly picturesque town that lies in the Hoang Lien Son mountain range near the Chinese border in north-western Vietnam. The best times of the year to visit Sapa are in the spring and fall when gold rice is ready to be harvested it will draw a marvelous scene you can never imagine. 5:00 am: Arrives in Lao Cai in the early morning, our driver or tour guide with the sign of your name will welcome you. You will be driven to Sa Pa in about 1 hour. Once you arrive, a morning shower will be offered and later on breakfast is served. The new day will be started 9:00 with the visit to Cat Cat and Sin Chai villages down in Muong Hoa valley. 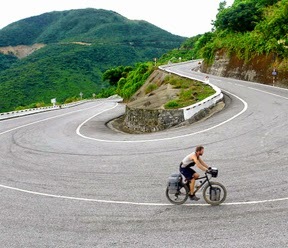 Enjoy the spectacular views of the beautiful valley towards Fansipan – highest peak in Vietnam and Indochina. Trek through the villages of Black H’mong ethnic minority to learn the way people weaving and embroidering their clothes, keep going down to enjoy colourful rice paddy fields and the interesting waterfall. Trek back to Sa Pa. In the afternoon free time to discover Sa Pa town and market.